Take a few moments to enjoy these incredible 3D positional audio demos, where you'll hear the impressive difference between regular stereo and QSound 3D stereo! 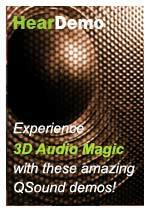 These QSound 3d audio demos were specifically designed to be listened to using desktop stereo speakers. For information on configuring your speakers in order to get the most from your QSound listening experience, please visit our "About QSound Demos" page. Important: You must use STEREO SPEAKERS to experience the 3D sound effect! In this demo, you'll hear the tower communicating to the pilot of a jumbo jet as he prepares to take-off right over your head! You'll hear this demo both in regular stereo and then in QSound 3D stereo enhancement! Stand beside the train tracks as the guard gates come down and a speeding diesel engine passes in front of you. You'll hear this demo both in regular stereo and then in QSound 3D stereo enhancement! In this audio demo, you'll hear our rock star play a song, while the mix switches between ordinary, regular stereo and QSound's rich sounding 3D stereo enhancement. Take a listen! Take a 3D positional audio tour around London! It's so immersive, you may think that you're really there!